I’ll get to writing up our Brisbane trip in full excruiciating detail in due course, but first what everyone wants to know: How is Go Card compared to Myki? Go Card seems faster; more responsive. On buses, ferries and railway stations we consistently seemed to get sub-second response times when touching the card — clearly faster than Myki. This might reflect that the Go Card, provided by Cubic (which built London’s Oyster card system), is a more mature technology. It also doesn’t have Windows CE on all the devices, which may help to slow down Myki further. The caveat however, is that major station fare gates open a good deal slower than Melbourne’s — both the older Metcard gates fitted with Myki readers, and the new Myki-only gates seen at Melbourne Central and Parliament stations. Quieter Brisbane stations had no fare gates, only standalone readers, like in Melbourne. I didn’t notice any Go Card readers or machines that weren’t working, though on the bus between Nerang and Surfers Paradise, I did see a nearby reader go to “Please wait…” status for an extended period on the trip to and from the beach. Perhaps it does that when crossing zone boundaries or something. Given the fast response times, peak hour buses didn’t seem to be a major problem for Go Card, with hordes of people able to enter and exit, touching their cards as necessary. However I didn’t see any crowds or conditions that were comparable to crowded Melbourne trams (with wide doors used for both entry and exit at the same time). It appears that if you fail to touch-off a Go Card, you get charged a “fixed” (default) fare which is often more than the cost of simply travelling to the zone at the end of the line as on Myki. Our Go Cards cost a refundable deposit of $5 each, half the cost of getting a Myki card — however this is because there is also a Go Card issue fee of $5 which is currently waived. As tourists into South-East Queensland, we can return the Go Cards by mail, and get full refunds on unused balances, plus (I assume) the $5 deposit. This is a feature that Myki does not yet have (unless you are willing to pay a $9.80 administration fee). This is particularly important given the Myki plan to have no short-term/paper tickets available. Like Myki, Go Cards can be topped-up can be done online or at the machines, or via bus drivers in $5 increments. (Top-up via bus drivers is currently possible with Myki in regional cities, for any amount, but it’s not clear if this will ever be available in Melbourne). You can also register for auto top-up, as with Myki. We used station machines to top-up. They had touch screens which perhaps weren’t as sensitive as they should have been (nor as responsive as the Myki machines), and sometimes took a few more presses than necessary to get to the right options. One top-up via a credit card didn’t work, just moments after I’d used the same credit card to top-up another Go Card. But it didn’t seem to be an issue with doing two transactions on the same credit card, as that worked on another day. Using cash worked fine. One problem we had is that it’s hard to work out how much your trip will cost. The fares are on the web site (if a little difficult to find, as they are not linked from the Go Card pages), but the (excellent) mobile web Journey Planner didn’t mention the zones or costs. 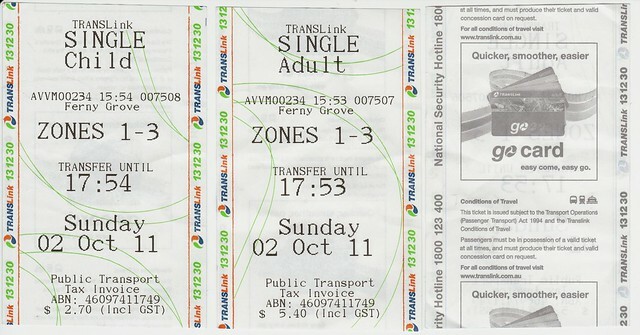 Printed timetables and maps did show zones. This made it difficult as we didn’t want to put too much money on the cards since we were only staying for five days. In the end we had about $8 left on our cards when we flew home, though this can be refunded (see above). South East Queensland’s Translink system has 23 zones, much smaller than Melbourne’s two zones (though bear in mind the comparable area would include places like Geelong, which is slated to be zone 4 under Myki). Suburban Brisbane, as far as I can make out, stretches up to about 8-9 zones from the CBD. This is both good and bad. Lots of smaller zones means travel across zone boundaries isn’t such a big jump, though the cost of a short trip is not that much cheaper (a single zone trip on Go Card: $2.65; on Myki $3.02 or $2.02). I wonder if the smaller zones encourage more people to drive to zone boundaries to get a cheaper fare, or if the smaller increments prevent this problem. In Melbourne this happens, but because there’s only one zone boundary, it limits how many locations get swamped by park and riders. Go Card offers off-peak fares at 15% off, including all weekend, which is quite good, though not as bargain-basement as Myki’s $3 all-day weekend fares. Go Card does not have a daily cap system, so if you happened to be making lots of trips all day, it could add up, though you do get up to five hours and three transfers onto other services, with a maximum of an hour between transfers. There are no weekly/monthly/yearly passes on Go Card. All they offer is a “frequent user discount“, which is a 50% discount on any trips after your tenth journey in any Monday to Sunday period. Robert Dow from the Queensland lobby group Rail Back On Track (the PTUA-equivalent) tells me it’s a weakness of the current implementation, so there may be not a lot they can do about it, though he says they could adjust the discount amount, and when it kicks in. Go Card can be used on Airtrain, but you don’t get the same discounts, because Airtrain has special fares. In contrast, Myki can’t be used at all to pay Skybus’s premium fares (though rumours abound that it will eventually be possible). My sister was wary about the expense of getting Go Cards for her family, and spent the first day travelling on paper tickets. This turned out to be quite expensive, as those fares are about 45% more. No wonder 80% of trips in South East Queensland use Go Card. She got Go Cards for the rest of the holiday, including travel to and around the Gold Coast. The paper tickets are thermal paper. They appear to have more restrictive transfer rules, and you have to find a human to let you through station barriers — along with the cost, these all encourage you onto Go Cards instead. They are also only available as single trip tickets. This may have been to further encourage people to switch, but caused Translink and the government major embarassment in August at the Ekka (Brisbane’s Royal Show equivalent), as thousands of occasional users had to queue to buy tickets to get home, with police eventually ordering rail officials to let people board trains without tickets, to prevent a crowd crush. In contrast, for many fares, Myki is only marginally cheaper than short term/paper/single Metcard fares. For instance, regional bus fares are only 10% different, resulting in many people continuing to buy single short term tickets off drivers (which are an expensive cardboard semi-smart card). The plan for Myki of course is to have no paper ticket option at all. This would be a retrograde step, since occasional users and those unable to obtain a Myki card before travel would have no fare option. Go Card is quite obviously more mature than Myki, despite being initiated around the same time, with the system going live about a year before Myki started in regional cities. It’s older technology though, using the (now hacked) MiFare Classic cards. Myki has more secure cards, better fare options (with daily caps and passes available). Response times have to be made consistently fast (as well as the other well-documented problems ironed-out). Some sort of paper ticket option should be provided, preferably with thermal paper tickets, which are cheap to produce and require staff assistance to get through gates. 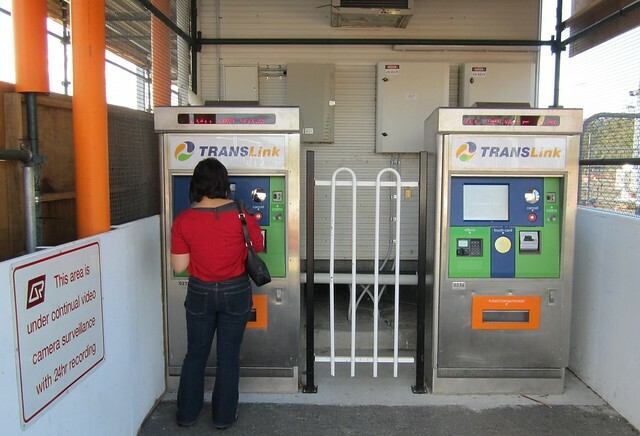 Myki fares should be at least 30% cheaper to further encourage their use. A refund system should be provided for Myki. Update: Some discussion on the points above on the Rail Back On Track forum. Regarding the Journey Planner showing zones, this is true for the main Translink web site, but not the mobile version. And I did know that Go Card refunds can be done over-the-counter, but assumed we wouldn’t have time to do this when catching the Airtrain back to the airport. Update 2: Note that the Myki $9.80 refund fee was removed in January 2012 — however although you can get a full refund of the card balance, the cost of the card itself ($6 full, $3 concession from January) can’t be refunded. And unlike Go Card the refund can’t be done over-the-counter — they send you a cheque in the mail. I’m glad I spotted the link to this on Twitter; I’ll be heading to Melbourne for four nights in a couple of weeks and will be usin PT every day while I’m there. If you don’t reply here, I may be emailing you to ask if I’m better off using paper tickets or using Myki. *Depending on your precise expected travel, some weird combination of individual Metcards maybe slightly cheaper, but I doubt it’d be more than a dollar or so; not worth the hassle. Note Skybus from the airport is a separate fare, if you’re using that. I only just recently became aware of the anomaly between paper ticket fares and Go Card fares on the Brisbane airport train. Although it’s been apparent almost since Go Card was first introduced they still haven’t fixed it. Really quite bizarre. On the topic of Myki and Skybus. 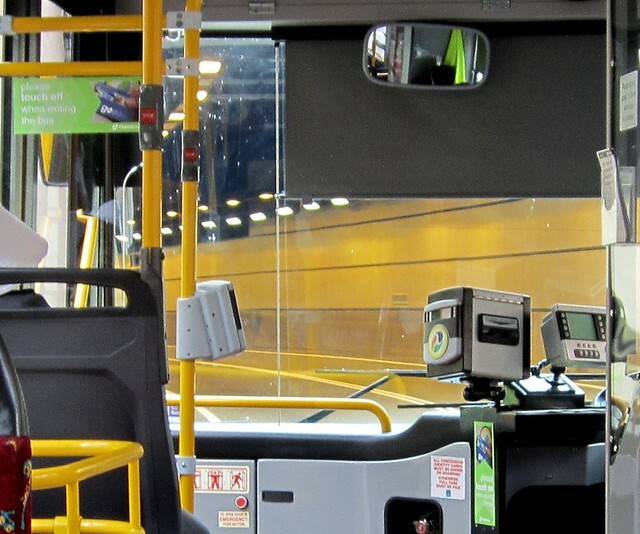 I noticed the other week when I used Skybus (first time in three years so beg my pardon if this is old news) that the bus I was on had the (pre)Myki reader leaflet holders installed on poles throughout the bus. So it must be on the agenda, or at least was on the agenda at one stage. I wonder how frequently GoCard users get overcharged, and how easy it is to deal with the bureaucracy to get things sorted out if something goes wrong. As I pretty much only use periodical tickets I haven’t been overcharged using Myki yet. However after losing a recently topped up myki and the nightmare I went through to get a replacement (along with the unused portion of my last periodical pass on it) means I dread having to deal with them again. Good summary daniel. I found go-card easier to use than myki. I did forget to tag off one bus, it was raining, I had shopping and was confused whether it was the right stop. Cost me another 50c because it assumed I went to the next zone. @Julian, according to the most recent Translink Tracker document, complaints and adjustment requests are recorded for about 3.5% of all Go Card trips. http://translink.com.au/resources/about-translink/reporting-and-publications/2010-11-quarterly-report-jan-to-mar.pdf – page 9. @Jen, those passes undoubtedly are very convenient, since you can pay once and not worry about it. They’re often not the cheapest option though… I note the Gold Coast Shuttle price for a trip from the airport is about $10; the Go Card price by the regular public bus is about $4 off-peak. I think it would be fine for jurisdictions to get rid of paper tickets if they just made the price of Go Cards/Mykis etc very low (As close to the cost of production)…Say $1 or $2, non refundable. The point is, it means the system can get rid of all short term ticket infrastructure, is freed of the inconvenience (Particlarly on buses) of people buying paper tickets, slowing things down….. And the only real sacrifice is that visitors/infrequent users pay a one off $1-$2 “Flagfall” to buy into the system, and they get to enjoy the benefits of the smart card anyway. Of course, it needs to be made easier to get refunds of credit over the counter for when they leave. Maybe Melbourne (And eventually all of Vic) are onto something by going Myki only. I think the success hinges on the price of the card, but I don’t think its going to kill anybody to make them pay a once of $1-$2. If it were at the $5+ level, as typical on Australian systems, then that might be a bit uncomfortably high, especially families visiting buying a card for everyone. They go to ‘Please Wait…’ in between the stops which depends on how the GPS has been set up. Eg: On approach to Queen St Bus Station from Cultural Centre, the readers will flick between ‘Please Touch Your Go Card’ to ‘Please Wait…’ and back again rather quickly before heading into the tunnel. This is because of the large ‘ring of confidence’ for the GPS at busway stations and the GPS unable to work underground. At normal bus stops though, they should switch between those messages approximately 25-50m before and after the stop as the bus goes past them. It’s just to stop people inadvertently touching the readers en-route, although there have been problems in the past with the GPS failing and the drivers not overriding the system, so the readers become stuck at one stop which can cause free fares if you touch on and touch off within 20mins and a fixed fare if you touch on and touch off greater than 20mins. This however doesn’t seem to be happening as much as it used to 12 months ago.